Can TiVo Premiere Give Blockbuster a Boost? TiVo is taking a big step with its brand new TiVo Premiere. The Series 4 set-top box, officially unveiled this week, brings a refreshed design and host of added features to the decade-old DVR system. TiVo Premiere boasts an HD-ready interface, up to 150 hours of HD-quality storage, and an optional souped-up remote complete with slide-out QWERTY keyboard. Most noteworthy, however, may be the Premiere's new Internet integration and seamless access to all kinds of multimedia content. For a company like Blockbuster, that change could make a significant difference. TiVo bills the Premiere as "the one box," and it's not hard to see why. The Series 4 device effortlessly integrates broadcast TV with the Web and various movie-streaming services, adding powerful global search options that tie everything together. For example, say you're searching for the movie Office Space. All you'd do is type the name into a search field, and TiVo Premiere would show you all the results across multiple platforms (no TPS report required). You might get a listing for an upcoming showing on a cable channel, a list of outtakes or behind-the-scenes footage on YouTube, and an option to rent the movie from an on-demand service of your choice. That's where the benefit for Blockbuster comes in. The company, as you may have read, recently reported a $435 million loss for its fourth quarter. More store closings are now in the cards, and some analysts are starting to question the one-time giant's viability for the future. Blockbuster's been available on certain TiVo models for a while now. But with the Premiere's new integrated cross-platform search, its offerings are more up front and center than ever -- and that means new opportunities for business. 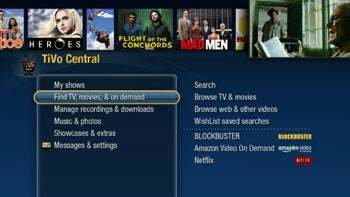 TiVo Premiere showcases on-demand rentals from Blockbuster, Amazon, and Netflix within its global search function. Of the three options, Blockbuster and Amazon are the most comparable: Netflix operates on a monthly subscription plan where you pay a flat fee in order to stream movies. Blockbuster and Amazon, in contrast, let you pay on a per-use basis -- typically a few bucks per movie -- with no subscription required. For people who rent less often or prefer avoiding commitments, then, Blockbuster will be one of two primary options presented during global searches on the TiVo Premiere. For a company very visibly struggling to survive right now, those odds aren't too shabby. Will TiVo Premiere single-handedly bring Blockbuster away from the brink of bankruptcy? Of course not. But the exposure it'll provide can only help to expand the company's income and show whether it has what it takes to compete in a digital world.